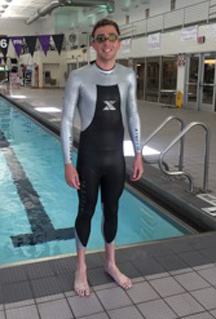 I just got my hands on a new Xterra Vengeance wetsuit yesterday. I am 6′ tall, 160 lbs. The Medium Long turned out to be spot on, at least trying it on dry. With wetsuits, you never really know until you get them wet and into a real swim. The concept of the Vengeance is to provide maximum shoulder and arm flexibility for a strong swimmer, while retaining ideal flotation benefits in the hips and thighs. Xterra uses a very thin, flexible fabric in the shoulders, arms and along the latissimus dorsi muscles (‘lats’) to let the swimmer feel as close to his natural stroke and range of motion without a suit. While swimming in a tri-specific wet suit, one has to sense that too much energy is being wasted overcoming the resistance to stretching inherent in the neoprene fabric. Minimizing this resistance, and diversion of effort from swimming to merely fighting the suit, is essential to wetsuit design. Many triathlon specific wetsuit makers claim to offer this solution, but to my knowledge, no one else is delivering it like Xterra right now. Another useful innovation in this suit is the leg length and opening. The leg length stops well short of the ankles, and is cut at an angle so that the diameter of the leg opening is much greater. This makes it much easier to take off in the T1 transition. Other wetsuits I have raced in include the Quintana Roo Hydrofull and the Zoot Prophet. Both are nice and fast, but the Xterra Vengeance is meant for a much more pure and natural swim experience. How Does It Feel In The Water? My first swim in the Vengeance was a recovery swim, on a day after I had already ridden and ran. I had not intended to do any speed work. After a bit of a warmup, I decided to swim 500 yards (short course) at Olympic distance race pace (around 1:10 per 100 meters) and I came into the wall at 5:00 without too much effort! This suit is fast and feels great! I am sold! A strong swimmer does not need flotation up front, but appreciates it in the hips and legs. This suit has just that balance. My body position was perfect, with high hips and thighs. Kicking was easy, and I did not have to work my legs hard to maintain speed. Jumping out of the pool and onto the deck, I simulated my T1, pretending to put my helmet on while stepping out of the suit. I was literally able to step out of it without using my hands once it was unzipped, off my arms and below my waist. This was without using any body glide or other lubrication. No chafing, either! I have included a couple of video clips showing how relaxed my shoulders and arms are while swimming int he Vengeance. You might also notice the nice leg flotation. 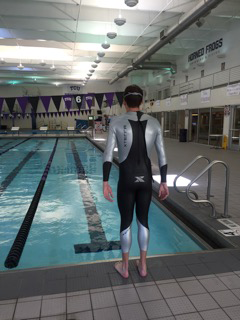 Overall, I am extremely impressed with what Xterra has done with this suit. For middle of the pack to strong swimmers, I would highly recommend this wetsuit because it doesn’t compromise swim technique for better buoyancy. I am thrilled to be wearing this suit coming into 2016 and am looking for some fast swims and even faster transitions. Thanks to Glynn and Jay at Xterra for hooking me up with such a nice wetsuit.